The Seiler iQ will add optical intelligence to your practice by allowing you to see it and believe it. High quality German Optics and the brightest standard light source on the market make the Seiler iQ the perfect addition to any operatory. 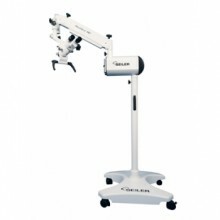 The IQ is also the most affordable high quality 3 step microscope on the market offering all of the accessories of the Evolution Model, including Live Video Options, Documentation set ups and many other accessories. Try the iQ in your office and see the Seiler Precision Difference. 0-180: Is a head that goes from 0° to 180°. It DOES have a little wider field of view than the 0-220 (the advantage), But does not have the interpupillary lever, also has fold down rubber eyecups. 0-220: Is a head that goes from 0° to 220°. It has an interpupillary distance lever which can be manipulated by turning the knob (nice feature), also has fold down rubber eyecups. The Video Package includes the accessories needed to view LIVE images on a monitor during the exam. Package Includes: 50/50-50/50 Beam Splitter, Video Camera Adapter, Video Cabling and High Resolution CCD Color Camera. 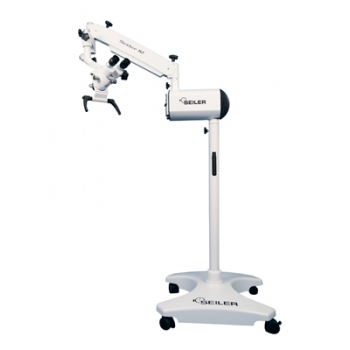 Click the button below to add the Seiler iQ Medical ENT Surgical Microscope to your wish list.